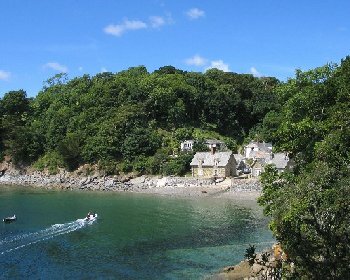 Durgan is a small hamlet that looks out onto the Helford River. There is a small sand and shingle beach with a slipway. There are no facilities, but there is great scenery and good walking along the Helford. The car park is about 15 minutes walking from the village, via a sloping foot path that follows the road and joins the road close to the village. Final access to the beach is via a slipway. Durgan is about 14 miles from Truro. From east or west take the A390 to Truro and at Truro follow the directions for Falmouth on the A39. Keep on the A39 to Falmouth until the Treliever Roundabout. This is a double roundabout. On the second roundabout take the 2nd left which is the road to Mabe Burnthouse. At Mabe Burnthouse in the village the road bends to the left. Here turn right onto a road signposted to Mawnan Smith. Follow this road for about 3 miles to Mawnan Smith. At Mawnan Smith follow the road through the village and shortly after the village turn left where signposted to Durgan. Follow this road to the Durgan car park. 1 car park about 15 minutes walking from Durgan village.